Both Tesco and Supervalu recalled the cheese from their stores on Tuesday. TWO BATCHES OF Wicklow Blue Cheese have been recalled due to the possible presence of Listeria. Now, the Wicklow Farmhouse Cheese has recalled two entire batches of its blue cheese. The FSAI warned that the two batches were being recalled as a precautionary measure due to the possible presence of Listeria monocytogenes. “This product is available through a number of retailers across the country, all of whom have been notified,” the FSAI said. Point of sale notices will be issued by the affected retailers. The affected batches are 16334C, with a use by date of 23 February. And 17018A with a use by date of 11 April. Earlier this month, the FSAI issued a public warning over a single batch of hummus from gourmet food store Avoca. This was also down to listeria fears. Listeriosis is a serious disease which can be life threatening, particularly for pregnant women, the elderly and other people with a weakened immune system. 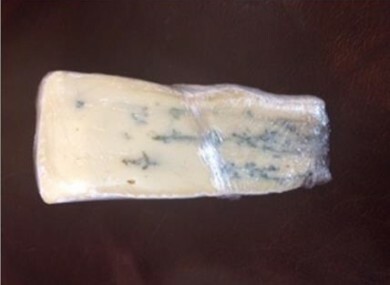 Email “Two batches of Wicklow Blue Cheese recalled over Listeria fears”. Feedback on “Two batches of Wicklow Blue Cheese recalled over Listeria fears”.